A short message to all people that have or plan on coming to Origin with huge zoom lenses and flashes that induce seizures, the food critics and wannabe food critics who end up just being lonely bloggers in front of their Mac at 3 a.m.
1. Do your research before you arrive. Have an open mind. 2. Understand the concept and accept the fact that Origin is not Colborne Lane. 3. If you can do a better job than me and my staff then why aren’t you doing it? I am truly flattered by guests at Origin that want to take pictures of my food. I am not against bloggers or critics. I only wish that my work is judged through a focused, clean lens and that the bloggers and critics ask questions, explore deeper before they upload or get published. I felt a little bit better and decided I wanted Origin up on Food & Co.
After not being able to find our reservation, the very friendly hostess seated us in the lively bar (its own separate space from the dining room complete with DJ) to wait while they got a table ready. We ordered drinks and not long after she was back, and seated us at a great table by a window looking out onto King St. And immediately we noticed the large percentage of attractive bartenders and waitstaff. A game may have been played called 'rate the waitstaff'' but I won't go into details. The menu was large and divided into multiple sections - snacks and sides, raw bar, mozzarella bar, chilled, hot and sweet. There were so many delicious sounding things. We also had questions and our waiter Charlie was very helpful in answering and was extremely knowledgeable. Good job. He also did very well in selling us one of Origin's nightly specials - a huge lobster for $75. We decided to just go for it. It sounded too good. And it was good. Really good. But in the end, we thought we should have ordered a couple more things to share instead of Mr. giant lobster. Rewind to before and we ordered the deviled eggs with bacon, the patatas bravas, raw tuna salad (so delicious with the avocado and asian pear), two mozzarella plates - one with pear and pine nuts and the other with pesto (we liked the pear one better and the bread was soft and easy to cut with the cheese on top), the black cod (melted in your mouth), and the duck wrap. There were so many other dishes we wanted to try and I wanted to take a few more pictures of the restaurant itself, but I didn't want to push it. During our meal the bar next door kept filling up and the DJ was playing great music, blaring into the restaurant, which was fine with us because we were singing along. Dessert time came and again we wanted to try it all, but still thinking about our $$ lobster, we just got two - the caramelized brioche (amazing, must order) and my all time favorite dessert - hot chocolate cake with (here's the best part) SOFT SERVE vanilla ice cream. They have a freakin' soft serve machine. And even though the cake was too small, the ice cream made up for it. Origin definitely lived up to the hype and hopefully Claudio wont cut me after this post! **Update - I randomly ended up at Origin again two nights later and tried a few other things. The calamari is a must - fried but not heavy in a delicious peanuty sauce. Also the creme caramel had these amazing little frozen raspberry bits that burst with flavour. The black cod was even better the second time. What do you do when you're stranded in Halifax for 2 days? Well...you go for lobster, and that's just what I did. On my way to St. John's for the JUNOs, a few of us got stuck in Halifax because of the weather. 4 years ago when the award show was in Halifax, a co-worker Sasha and I went on a romantic date at a water side restaurant near our hotel, called Salty's. We both ordered pasta with lobster and it was the best thing we'd ever had. To this day I bring up Salty's to Sasha at least once every few months (in the last few weeks, way more. Sorry Sash!). So since I found myself in Halifax once again, I thought why not take the stranded crew to the place I loved so much. And right when I walked in, it was a bit different. First they didn't have the lobster pasta, and second the place was a tad dingier then I had remembered. Anyway even though the food wasn't the greatest, it was the people around the table that made it a great time. This blog post is dedicated to: Jen B, Jen C, Josh Hendo, Chris Wadsworth (aka Halliwood), Jully B (who just wanted some damn good yam fries) and Michael G (the vegetarian). With two locations - one at Avenue Road and Eglinton and the other in the Danforth, 7 Numbers is your one stop shop for delicious home cooked Italian food. 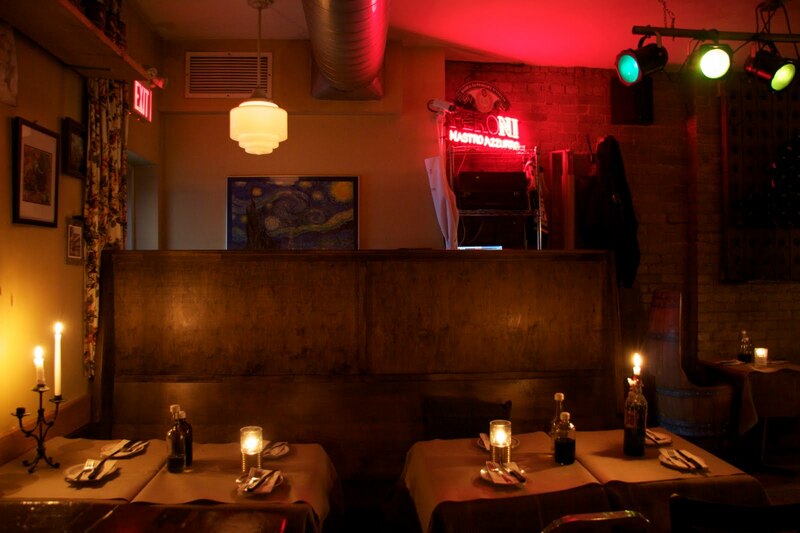 Right down the street from my parents house, we'd frequent 7 Numbers Eglinton location often. 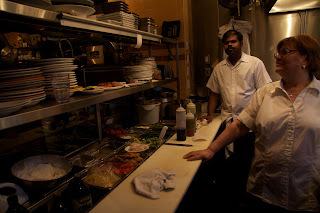 And with their kitchen at the very front of the restaurant, chef Rosa welcomes you at the door and makes you feel right at home, while also being able to watch over her extended family - the customers. The simple yet extensive menu offers lots - from one of my favourites - the green bean and asparagus salad, to small and large sized pastas, and different meat dishes like osso buco. To start, the calamari is almost always ordered. 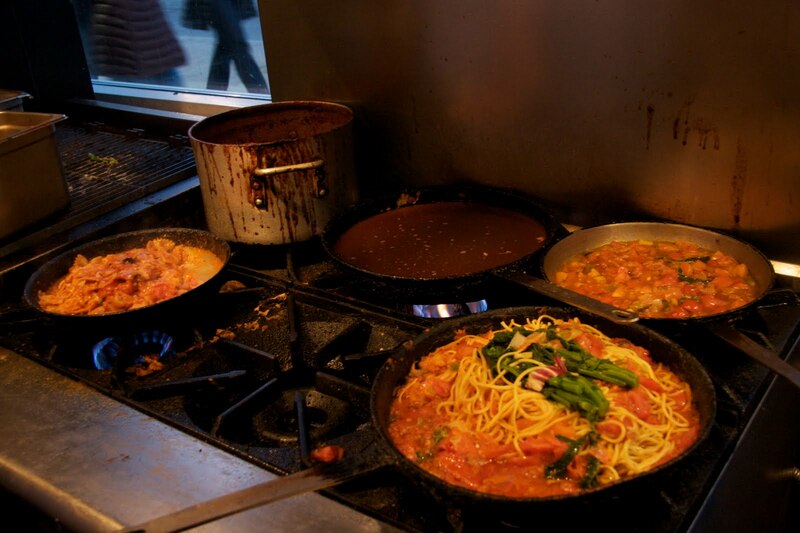 Same goes for a pasta dish - either the bowties with tomato sauce and ricotta, or the linguini with rapini. Last time we were there we also tried out the mozzarella stuffed meatballs. Yum! 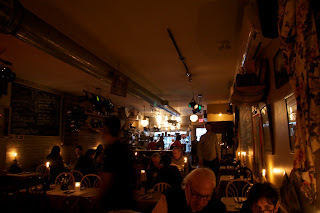 The laid back, casual vibe and good food, will keep everyone coming home (I mean back) for more. I'm usually not a fan of waiting a while for a table, especially for brunch. You're hungry and sometimes hungover, and want food right away. But this Sunday was different. It was a gorgeous day and I'd heard such great things about Saving Grace, I was good to chill for a while on Dundas. We got there at around 11am and there were groups of people waiting outside. I soon discovered to get a table, you have to write your own name on a list hanging up just inside the door. After about 30 minutes, me and two friends were seated along the bar overlooking the restaurant - a fun people watching vantage point. And right away after sitting down, you immediately feel at ease. The small casual space, the friendly relaxed servers, there's something about the place that's perfect to take in and enjoy on a weekend morning. I thought the full menu was written out on the massive chalkboard mounted on the wall a la Hoof Cafe style, but those were just the specials. So many things to choose from including tons of delicious sounding eggs, muffins and fresh fruit juices. They had an incredible baked egg dish, that according to the patron sitting beside me, changes each week. I should have snapped a picture of it. We tried out some of the fruit juices - the apple raspberry was just the right amount tangy and sweet, and enjoyed a cornmeal monterey jack muffin while waiting for our mains. We all went for the sweet - the waffles, vegan pancakes and the banana caramel french toast. The french toast was cool because it was made with a bread not usually used for the dish. It was also super sweet because of the caramel and bananas and maple syrup. It was good but I sorta wish I had ordered one of the egg dishes. Next time! And hopefully that next time will be soon!